After our morning Service on the 6th, we will enjoy our monthly ‘Bring and Share Lunch‘ which always take place on the first Sunday of each month. At 17:00 Revd. Andrew Bullock will participate in the joint leadership of a Service with the Protestant Community in Arcachon. Many of us will drive to Arcachon after the Bring and Share lunch. If you would like to share or offer transport to Arcachon then please ask Andrew or one of the committee. The Temple Protestant de l’Eglise Unie Arcachon, place Fleming, Allée Anglicane, 33120 Arcachon. Please ‘click’ here for a map. 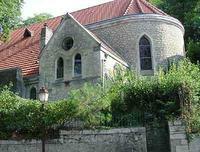 The church has a historic connection to the Chaplaincy and was originally known as the church of St Thomas. Please ‘click’ here for the view from the road.